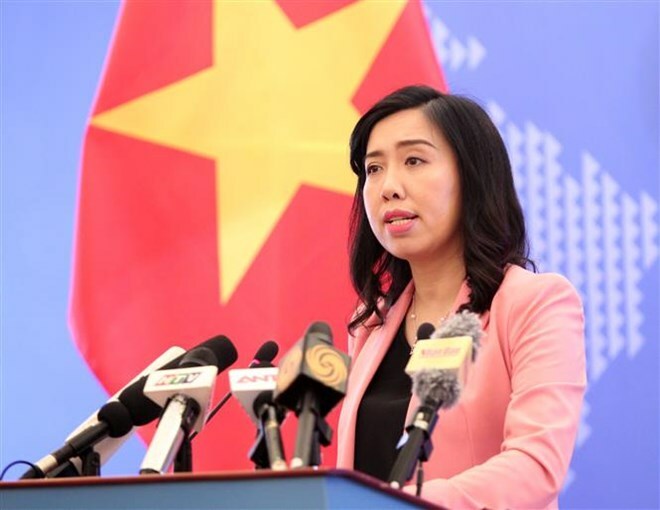 Vietnam has reported its outstanding achievements in guaranteeing human rights in its third-cycle Universal Periodic Review (UPR), Spokesperson for the Ministry of Foreign Affairs Le Thi Thu Hang has said. At the ministry’s regular press conference in Hanoi on December 6, Hang briefed the media about these outstanding achievements which were contained in the country's third-cycle UPR that was officially submitted to the UN Human Rights Council (UNHRC). The UPR is an inter-governmental mechanism of the UNHRC, aimed at reviewing issues related to the human rights of all UN member countries. It was made periodically every four or five years to the principle of dialogue, cooperation, equality, objectivity, transparency, and construction. “Vietnam supports the UNHRC’s UPR and is always serious in making the review and implementing the recommendations it accepted in the first-cycle UPR in 2009 and the second-cycle UPR in 2014,” Hang said. The third-cycle UPR deals comprehensively with the guarantee of human rights in Vietnam since the second-cycle UPR, updates laws and policies pertaining to human rights, reports on the outcomes of ensuring human rights across the board, and screens the implementation of the recommendations Vietnam accepted in the second-cycle UPR. The report also defines prioritized commitments of the country in the coming years. As by October 10, 2018, Vietnam implemented 175 out of the 182 recommendations it accepted in the second-cycle UPR, or 96.2 percent. The remaining seven recommendations are being implemented or are being considered for implementation at an appropriate time. The report lists a number of outstanding achievements of Vietnam in ensuring human rights, including the adoption of the 2013 Constitution and the revision and issuance of over 90 legal documents relating to the guarantee of human rights. Vietnam’s per capita income has increased continuously and the income of poor households has risen from between 15-20 percent. Meanwhile, the multi-dimensional poverty rate dropped from 9.88 percent in 2015 to 7.69 percent last year. Some 38 percent of ethnic minorities have moved to the group with higher economic conditions (the national level is 28 percent). Universal kindergarten education for five-year-old children and universal primary education have been done in all 63 cities and provinces. The percentage of women owning enterprises hits 27.8 percent while the percentage of female National Assembly deputies in the 2016-2021 tenure is 26.71 percent. There were achievements in ensuring civil and political rights, including the right to equality before the law, the freedom of the press and the Internet freedom. People’s religious and spiritual life has been thriving with over 95 percent of the population leading a spiritual or religious life, Hang said.